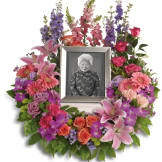 This floral wreath is a unique and special way to share and honor memories that you will always cherish. 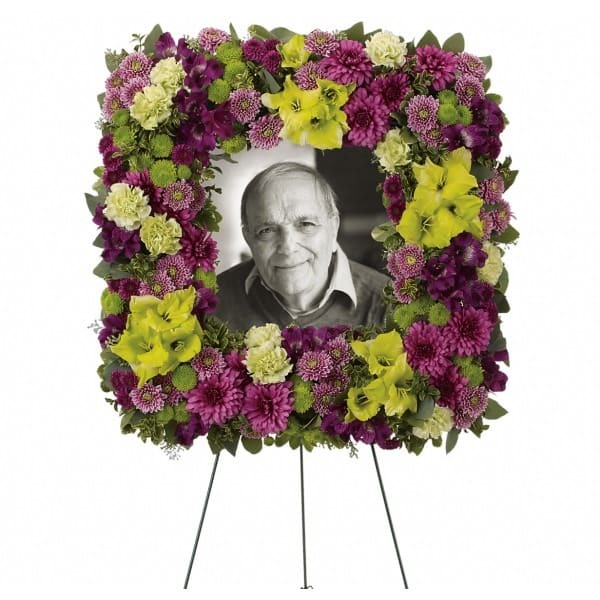 Rich purple and soothing green blooms are mixed to perfectly showcase a treasured photo. 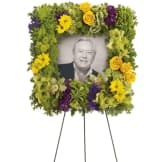 • This contemporary arrangement includes purple alstroemeria, green gladioli, green carnations, purple cushion spray chrysanthemums, lavender, purple, and green button spray chrysanthemums, and accented with assorted greenery. • Measures approximately 23 1/2" W X 23 1/2" H.
Flowers will be received by a Weigel Funeral Home's staff. 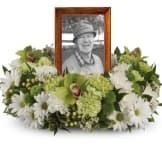 All of our flowers are designed and delivered by hand from a local florist in in Hamilton.